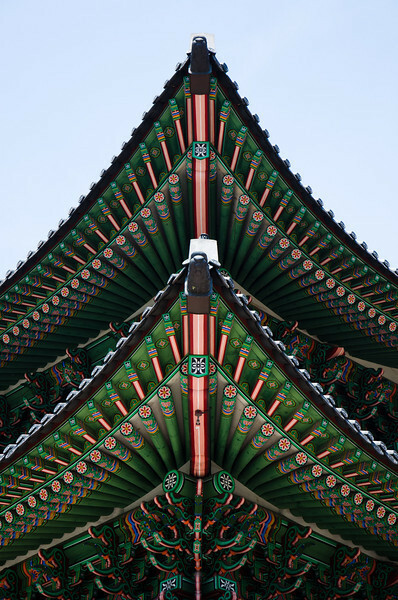 As with many South East Asian countries, Koreans place great importance on natural remedies in the prevention and alleviation of the numerous ailments that afflict the human body. One of the biggest weapons in the Korean herbal arsenal is the ginseng root. According to one source, it, “…rejuvenates the body, boosts metabolism, reduces stress, treats diabetes, improves respiratory illnesses, spurs the digestive organs, and has anti-carcinogenic capabilities…“. I’d be happy if it only did half of what it claimed! 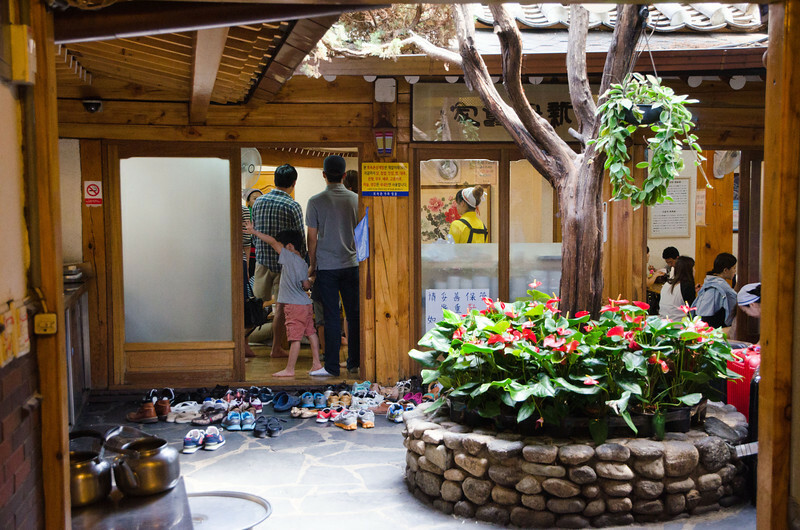 While walking the streets we seemed to walk past a ginseng shop every 50 metres! 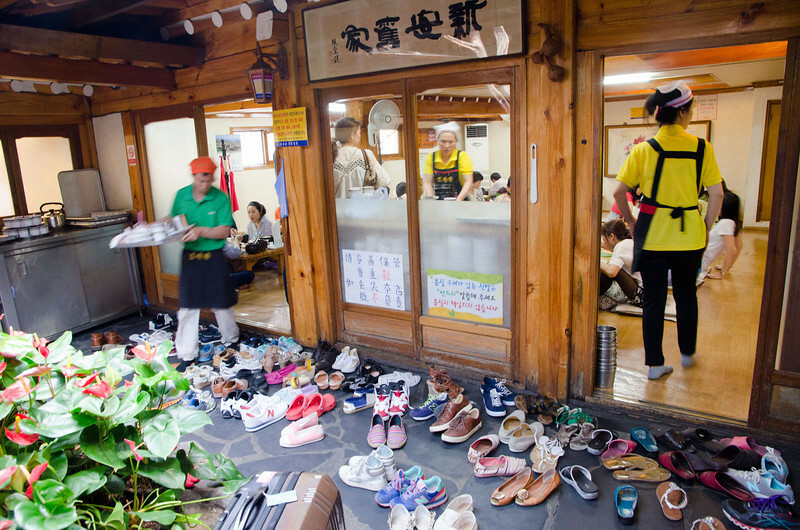 Impossible to miss, they would normally consist of a number of large bottles out the front of their premises, with a single massive ginseng root stuffed into each bottle and then topped up with some sort of mystery liquid. I couldn’t possibly think why I would need so much ginseng drink in my life, but obviously the locals love it! 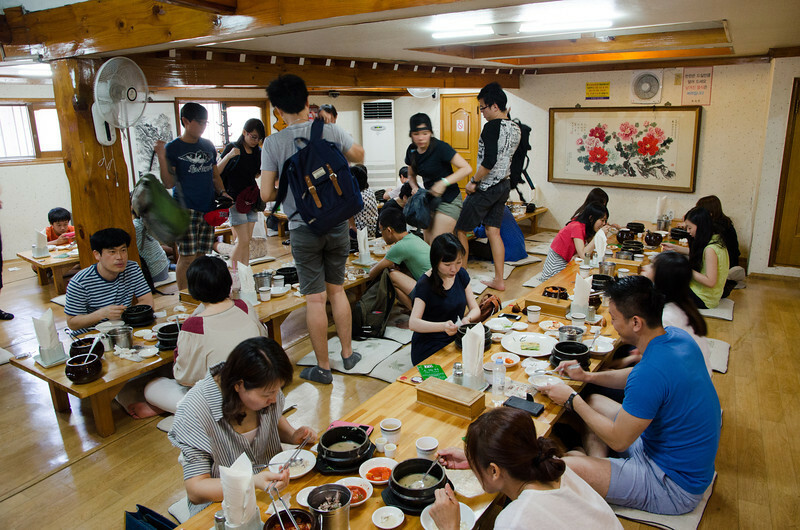 It may sound a little strange, but when summer is at it’s most hot and humid Koreans turn to one particular dish to restore their loss of stamina and reinvigorate their circulatory system. 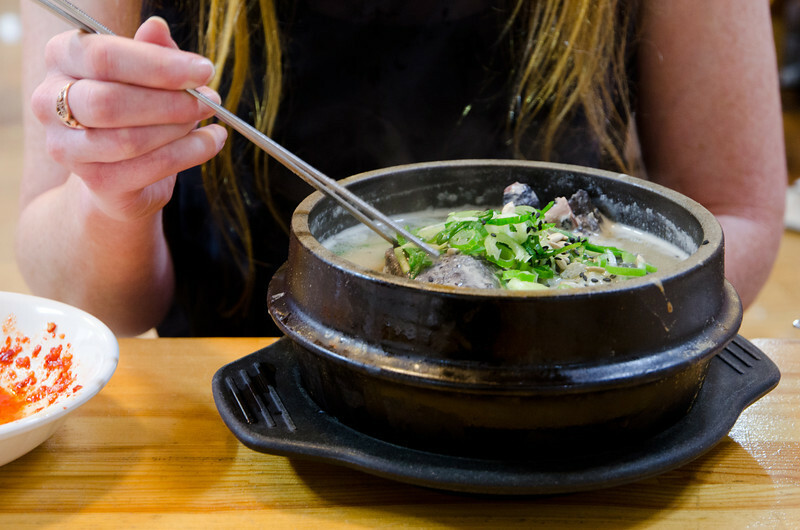 Fighting heat with heat, over the centuries the dish known as samgyetang has become a firm favourite on the hottest days of the Korean calendar. 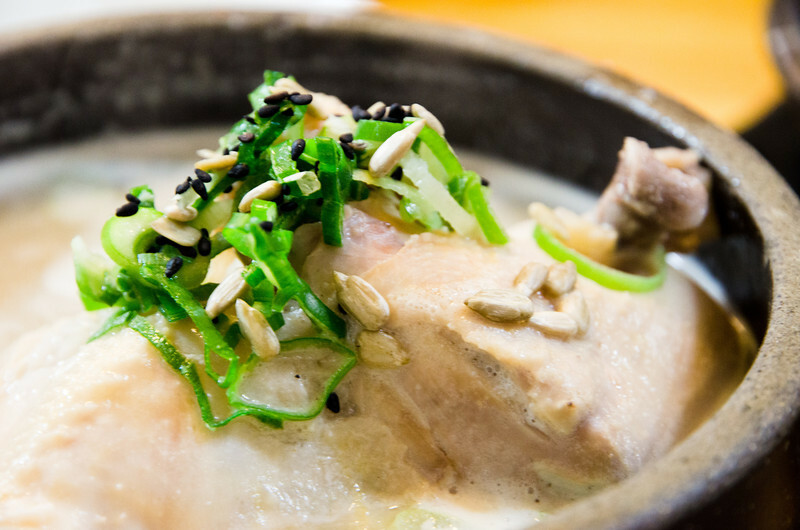 In English, samgyetang translates to “ginseng chicken soup” and that’s exactly what you get. However, not only do you get the medicinal benefits of the ginseng, there are numerous other herbs and medicinal ingredients included in the mix, such as jujube, garlic, gingko nut and ginger. 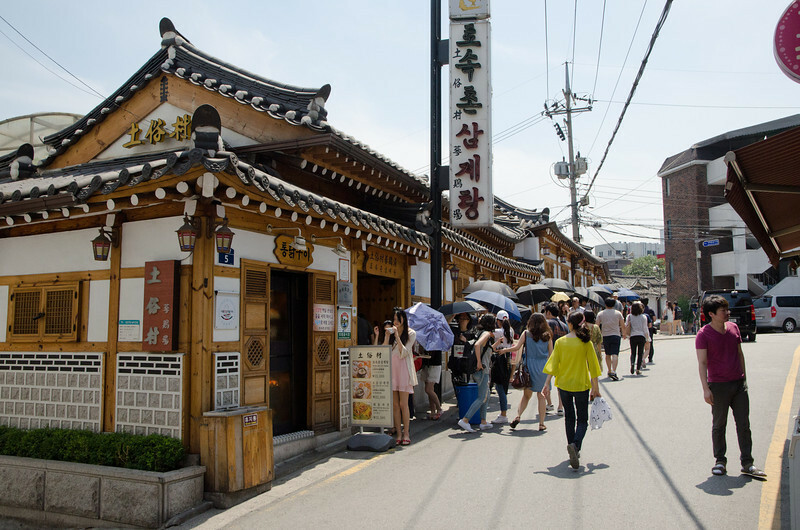 We were in the vicinity of the Gyeonbokgung Palace anyway, so we thought we would take the opportunity to drop by one of Seoul’s most famous samgyetang restaurants, Tosokchon. Unfortunately, with fame comes a lot of interest, both local and international! On turning the corner it very quickly became obvious we were at the right venue when we saw the queue stretching out the door, up the street for 25 metres, and around the corner for another 25 metres!! They have such high turnover though that it only took us around 20 minutes from joining the queue to stepping through the front door. This is less than half the line! 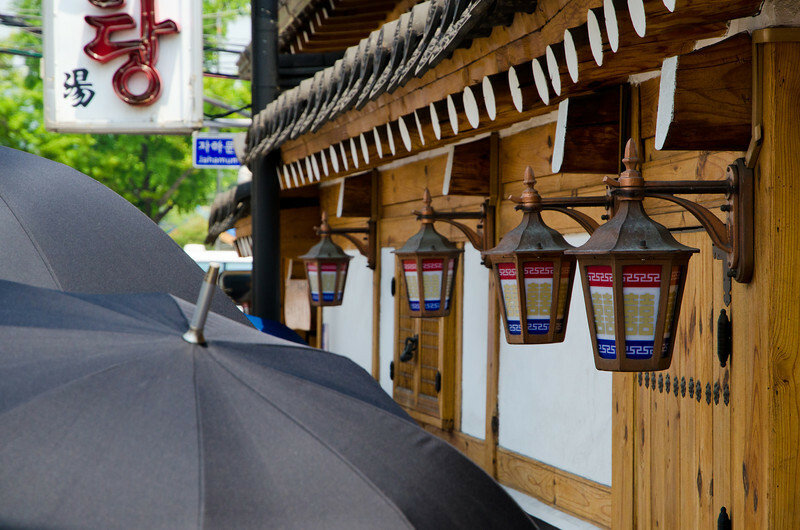 A great idea handing out umbrellas to everyone waiting in the scorching summer sun! 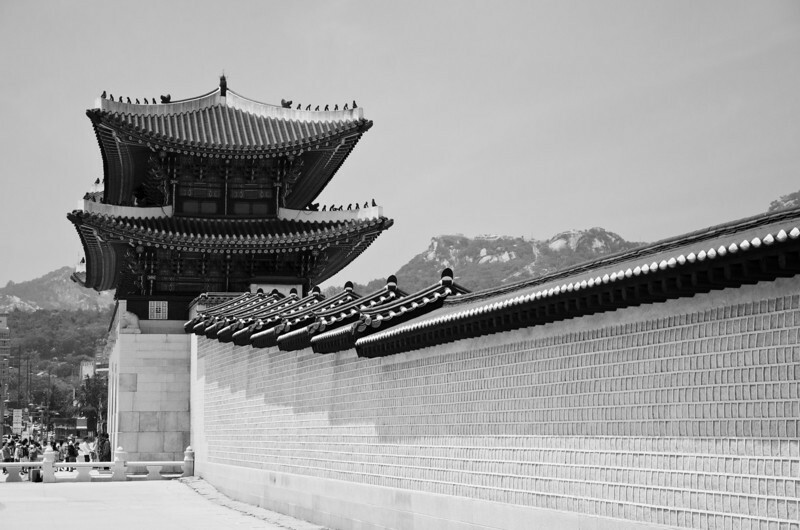 The building is architecturally gorgeous, as it used to function as a traditional hanok (more on hanoks here). After removing our shoes, we were directed to a position at one of the low tables where we plonked ourselves down on mats, and did our best to make it look like sitting cross-legged on the floor was an everyday activity for us both! A couple of menus were presented and we decided to try both the regular samgyetang (~$15AUD), and also a black samgyetang (~$22AUD). It’s not easy to make a soup look good, but the presentation was fantastic. I couldn’t believe the texture of the chicken when I picked it up with the chopsticks. Whole pieces literally fell off the bone and back into the rich broth below. At the same time I realised that not only was there half a chicken in the soup, but the chicken had been stuffed full of rice as well! Both Karen and I actually preferred the black version of the samgyetang, as it seemed to have a greater depth of flavour. We’ve tried to find out how they blacken the skin on the chicken but with no success. Perhaps the use of sesame seeds or ash? EDIT: We’ve recently found out that the black colour comes from the use of silkie chickens. Apparently these chickens have naturally black skin, flesh and bones!! Regardless, you’d have a lot more kids taking their medicine if it tasted as good as this every time! There wasn’t anything fancy to this meal. No frills, no embellishments, just a simple, traditional dish done extremely well. When you consider how many hundreds of meals they must be serving per day you really need to give massive credit to the team behind the scenes, not only in the procurement of all the raw ingredients (I hear they use ‘free range’ chickens…but what that means in Korea I’m not entirely sure), but also in the technique to get so many chickens cooked so well in time to serve the paying customers. This was actually one of the more expensive meals we’ve had in Korea thus far, but when you consider that it isn’t just a meal and that it’s also a medicinal treatment (and the fact that you’re eating a whole chicken!) I still consider it very good value. At times it was messy, but that’s part of the fun, and overall it was a fantastic meal that hit the spot for us both on what was a very hot day! Still the best Samgyetang I’ve had in Korea. Great write up and pics! Cheers! I’m glad to hear that because we didn’t get a chance to try the same dish elsewhere as a point of comparison. As a side note, I’ve recently found out that the black colour is from the use of silky chickens! It was! So much flavour packed into a single bowl.